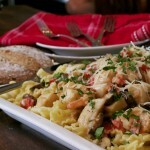 Monterey Seafood Pasta-What the "Forks" for Dinner? 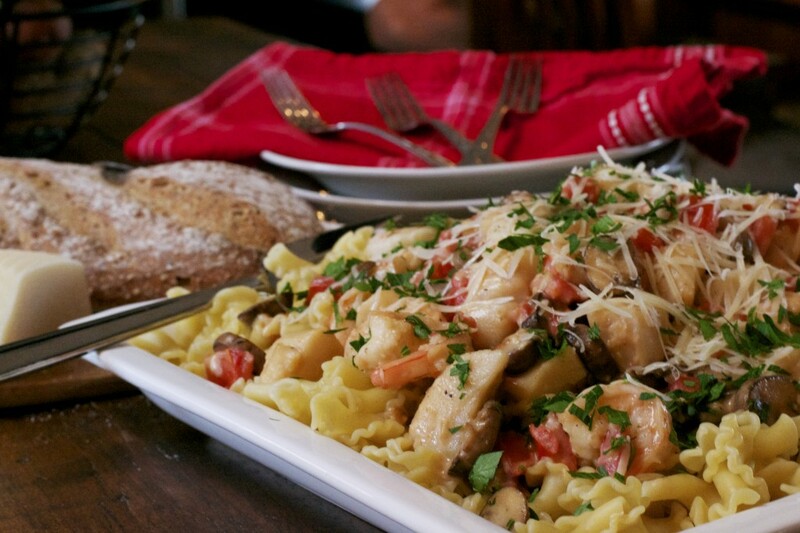 Seafood and pasta……..a match made in heaven. There is something about seafood, that when combined with pasta and something creamy, turns those ingredients into the yummiest thing ever! I was going through some of my old recipes……….I have tons of them……. I have been collecting them since I was in High School. Home-Ec classes were my favorite. So, along with Home-ec and influences from my Grandmother, I have always loved to cook ……..it’s my way of showing love to friends, but mostly to family. Tim’s twin brother Tom is here from the Philippines, and we wanted to stay in and have a nice dinner (we wanted to show Tom a little love) and watch our new TV……….48″ Sony with a new sound bar. 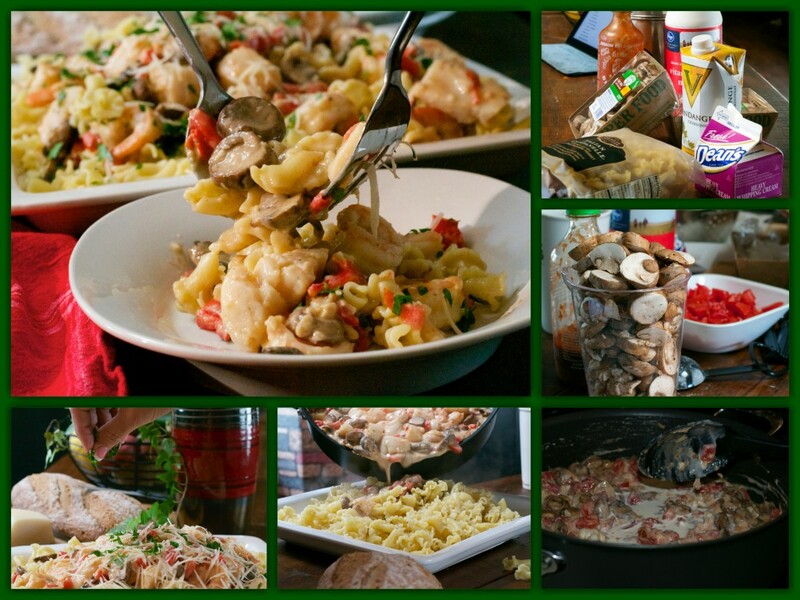 So, while going through those old recipes, I found a seafood pasta dish called “Monterey Seafood Pasta”. I have no idea where I got the original recipe. After a bit of rewriting, I made it last night and the result was wonderful………creamy, a little bit spicy, with mushrooms and tomato, and of course the star of the show, the seafood. 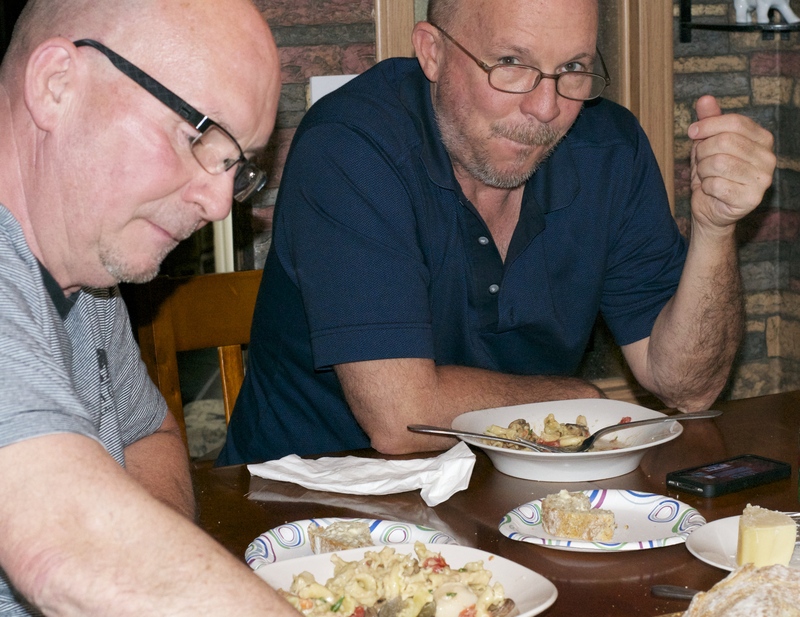 We added a loaf of crusty whole grain Italian bread and both Tim and Tom said it was a tasty pasta dish. Tim looked at me while eating and said “complements to the Chef”. If I can please my spice loving husband, it is a success! Chopped fresh parsley and grated Parmesan cheese for garnish. Melt 2 tablespoons butter in a large saucepan. Add 2 tablespoons flour, stirring 1 minute, whisk in 2 cups milk and bring to a boil, stirring constantly until thickened. Meanwhile melt 3 tablespoons of butter in a large skillet over medium high heat, add shrimp and scallop, season with salt and pepper and cook for 3 minutes. Transfer to a bowl. Add garlic and mushrooms to same skillet and cook over medium heat for about 4 minutes. Add to bowl with shrimp and scallops. Increase heat to high and add white wine and brandy and cook for 2 minutes. Add milk mixture, tomatoes, sriracha sauce, and heavy cream to skillet. Bring to a boil. Return shrimp and scallops to skillet and heat through. Pour over pasta. Sprinkle with parsley and parmesan cheese. Serve immediately. 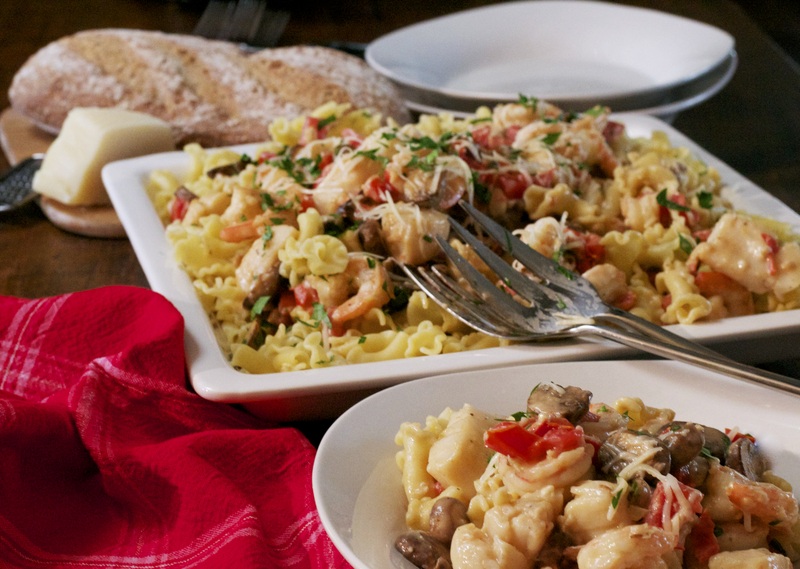 Seafood pasta, sounds amazing. Bookmarking this right away! Thank you we hope you enjoy it as much as we did!